Pastor Dean joins Cathy and I this evening to speak about his awakening to the enclosed world system and what it has been like to teach these truths to his congregation. One of the first pastors to go public to his congregation with such knowledge. He has performed his own experimental tests to measure curvature and finding it nonexistent has proven beyond a shadow of a doubt that the earth is not spherical like a ball as taught to us by the scientific world. 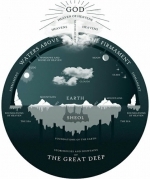 In this show, we speak about the many biblical passages which assert in teaching that the earth does not in any way move, but that it is a circular plane enclosed over by the firmament as vaulted dome.